A R T & D E S I G N b y c a n d a c e b r e k k e : Great event coming to Minot State! 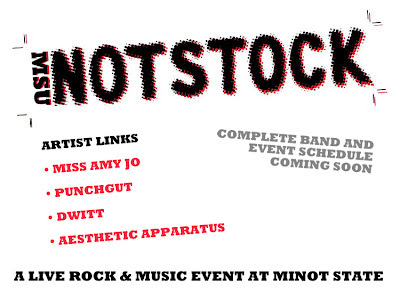 Reminiscent of **Flatstock, Minot State's art department is holding its very own MSU NotStock event featuring poster designers and local musicians. Should be an awesome opportunity for the students and public to experience some great works. Last year, MSU's design department brought in Jay Ryan, another great talent. Check him out, too! These people make my head spin with all their creativity and talent!! **The FLATSTOCK poster show series is presented by the American Poster Institute (API). It is an ongoing series of exhibitions featuring the work of many of the most popular concert poster artists working today.